In warm weather, and for briefer periods of time even in cold weather, a balcony or deck is always a popular gathering spot for family and guests. This is especially so during parties and social gatherings, when people often seem to migrate to a back or side porch/deck (assuming one is there.) These decks and porches are frequently overcrowded. And how about functions that are held at a hotel, on its outdoor deck? Have you ever asked yourself if you are safe, when you step onto someone else’s porch, deck or balcony? You probably should. It’s a little-known fact, but true: Many porches, balconies, decks, and railings – whether at private homes or at hotels and businesses - are either not designed properly, or are not safe. They are often faulty due to poor construction, defective design, or improper maintenance. The result? Frequently, a catastrophic failure at the worst possible time, due to the structure’s inability to support any substantial weight or stress. Every year, hundreds of thousands of people are catastrophically injured or killed due to the collapse of balconies, porches, decks, and railings. If this has happened to you – or someone you care about – you may be entitled to recover substantial legal damages for your injuries and losses. Brain injuries and head trauma. These injuries can often require months or years of physical therapy to recover from, and many people suffering these types of injuries never fully recover 100%. If you or someone you care about has been injured in a Massachusetts railing, deck or porch collapse accident, after securing emergency medical treatment, your first step should be to click here to receive our FREE article, “The Top 10 Things To Do After Suffering An Injury or Accident in Massachusetts.” This valuable article will give you a “road map” of how to proceed, what to do – and importantly what not to do - following a Massachusetts railing/porch/deck collapse accident. If you have been injured in this type of accident, you may be entitled to recover substantial financial damages for your injuries. After downloading this article, call our offices at Ph. : (781) 320-0062, or at Ph. : (617) 285-3600; or click here to send us a confidential email. We’ll provide you with a FREE, NO OBLIGATION CONSULTATION, and help map out what your best legal choices are. Most decks are made of wood, and can be especially problematic. If they are not constructed from a type of special, pressure-treated lumber that can stand up to rain, snow, ice and the four seasons that we experience here in Massachusetts, rot can set in very easily, and be undetected until the accident occurs. And don’t forget termites: They eat wood like ants eat crumbs – except you can see ants; you can’t see termites or the gradual damage they cause, because they eat wood from the inside, out. You won’t discover the damage until the wood gives way, and by then it’s too late. Some statistics show that there are millions of wooden decks in the United States that are more than 25 years old. They’re serious accidents, waiting to happen. 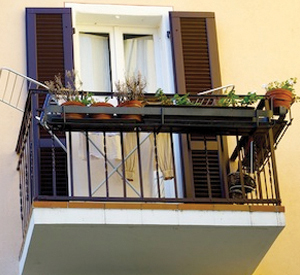 Frequently, balconies and porches are erected in violation of local building codes and regulations. This is true more often when the property owner does the construction himself, but violations of building codes also occur even with a “contractor” doing the work. If applicable rules and regulations are not followed, this creates a dangerous hazard. Whether the owner of the property involved is an individual, or commercial business, the owner of that property has a legal duty to assure that their premises are safe and that the deck and railings are installed and maintained in accordance with applicable Building Codes and other industry safety standards. The bottom line here? If you or someone you care about has been injured in this type of accident, you may be entitled to recover substantial damages for your injuries and losses. At the Law Offices of William D. Kickham and Associates, we know how to very effectively litigate these cases, for our injured clients’ maximum financial benefit, and we can show this with our proven case results. If you recognize Attorney Kickham’s name, it’s probably because you’ve seen him on television or in newspapers. He is frequently sought out for his legal expertise and analysis by a variety of TV and radio stations as well as newspapers. These media outlets include, among others, Court TV (now In Session on HLN,) Fox News TV-25/Boston, The Boston Herald, WBZ-AM Radio 1030, WCVB-TV5/Boston, Nightside With Dan Rea, Greater Boston With Emily Rooney, Money Matters Radio/Boston, and The Metro Newspaper/Boston. The media seeks out Attorney William Kickham because they know of his expertise in Massachusetts injury law. If you’ve suffered an injury due to a railing, deck or porch collapse, make the right choice in the attorney that you hire to represent you. Contact the Greater Boston law firm of William D. Kickham to schedule a free initial consultation. Call us at Ph. : (781) 320-0062, or at Ph. : (617) 285-3600; or click here to send us a confidential email. We promise to get right back to you. We’ll provide you with a FREE CONSULTATION, and let you know what your best legal choices are. Our promise to you: If we decide to accept your case, we will not stop until we secure the maximum amount of financial compensation possible for you.